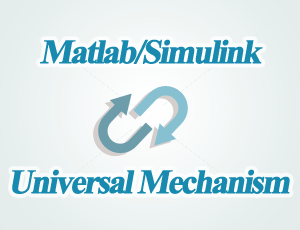 Program package "Universal Mechanism" is intended for simulation of kinematics and dynamics of planar and spatial mechanical systems. 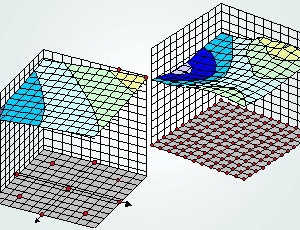 UM has an advanced postprocessor, which includes: linear analysis, statistics, multivariant calculation, wear and durability analysis and export of results. 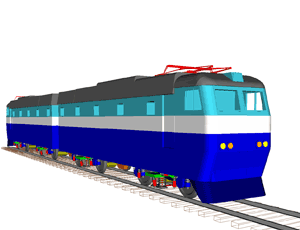 UM is a useful tool for the computer-aided modeling of multibody and hybrid systems of various types: complex aerospace structures, robots, railway vehicles, automobiles, cable systems, etc. 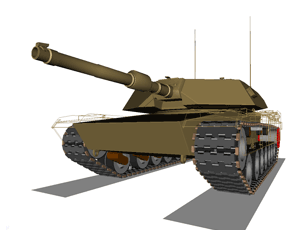 It gives an opportunity to solve both the direct and inverse kinematic, dynamic, and control problems. There are special prices of UM for scientific and educational purposes. 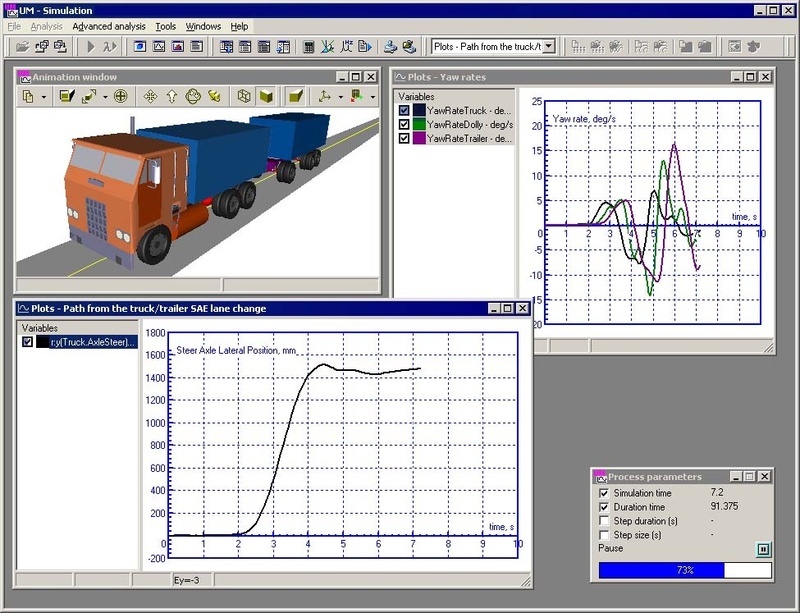 UM includes kernel and number of additional task-oriented modules: UM Automotive, UM Loco, UM Tracked Vehicle, UM CAD Interfaces, UM FEM, UM Experiments, UM Control and others. 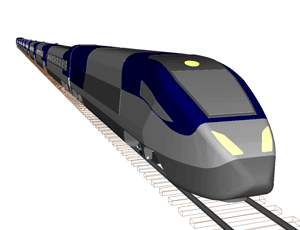 Our engineers can help you to carry out dynamic research of your mechanical systems. 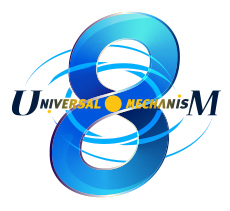 Download the latest UM release and know more details about free trial license here. 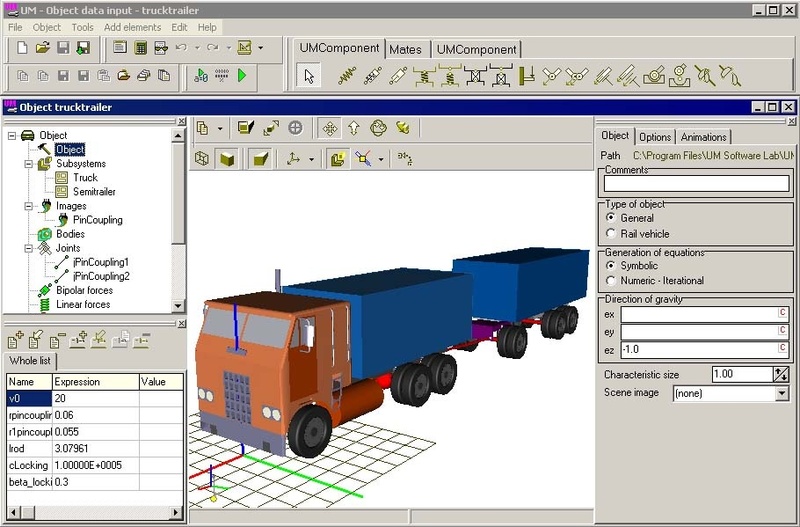 Using UM for modeling of mechanical systems, main features of the program package, its modules and lots of animations are presented here (PowerPoint presentation, zip-archive, 83 Mb). 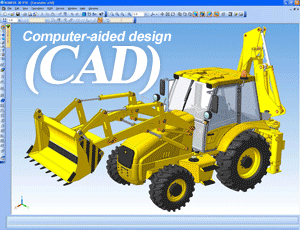 - Import inertia properties of bodies from Unigraphics NX, SolidWorks, Autodesk Inventor, KOMPAS-3D, Pro/E, PTC Creo. 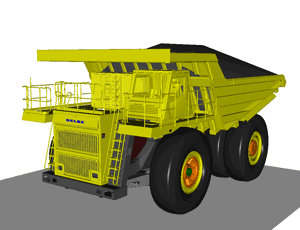 - Import from Unigraphics NX, SolidWorks, Autodesk Inventor, KOMPAS-3D. - up-to-date/professional video card is strongly recommended in the case of working with bodies imported from CAD or FEM software; NVIDIA graphics cards are highly recommended.